Looking for the perfect pair of shoes for your little one? Look no further! Pediped is your answer! 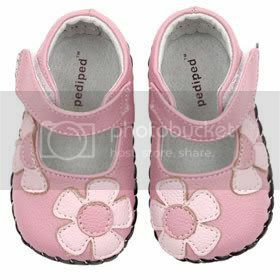 Founded in February 2005 by Angela and Brian Edgeworth Pediped is one of the fastest growing children's footwear brands in the U.S. Exceptional quality, unsurpassed comfort and distinctive styling are what make pediped™ unique in the children's shoe industry. Why choose Pediped? First of all, Pediped is officially recognized by the American Podiatric Medical Association as contributing to better foot health. Pediped™ footwear is a smart choice for parents concerned with the long‐term development of their children's feet. Pediped™ has been awarded the prestigious APMA Seal of Acceptance for both its Originals ™ and Flex ™ lines in support of their many beneficial attributes that promote quality foot health including soft cushioned leather soles, a wide toe box and soft leather uppers. Not only are Pedipeds "the next best thing to bare feet" but with over 45 fashion‐forward styles to choose from Pediped™ footwear is sure to compliment any look. Designs include: all occasion Mary Janes, patent holiday shoes, traditional penny loafers, breezy sandals and ultra‐cool athletic shoes. You are sure to find the perfect shoe for any look and any occasion! Pediped graciously sent me a pair of the Grace shoes from their Originals line for me to review. I LOVE these shoes!! First of all, I love how fun and stylish these shoes are! With so many styles to choose from it's easy to find a pair that is perfect for your little girl or boy!! Pediped has a large selection for both. 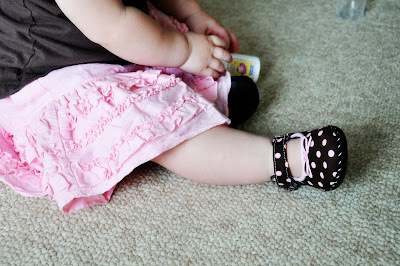 Secondly, since Ella is a new walker it was important that the shoes bend with her foot. These shoes are perfect. The leather bottoms are sturdy enough for her to walk on outside surfaces but they still bend to allow her feet to move naturally. She can also easily walk on indoor surfaces like wood and tile without slipping. She has had no problems getting around with these shoes! Another great feature is the velcro closure that makes these shoes quick and easy to put on or take off. My kids tend to have chubby feet and these shoes easily fit with room to grow. 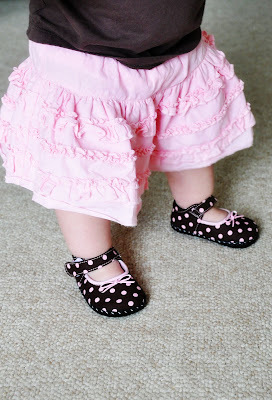 These shoes are well made and sturdy and will outlast the length of time your child will need them. The Pediped Originals line typically run $32 a pair. Currently there are many pairs available for $19 like the Caroline in Pink or the Liam in chocolate brown/baby blue! Also, coming soon is the Pediped Fall/Winter 2009 line!! This newest line will be available in August so be sure to check em' out!! That style is so cute!